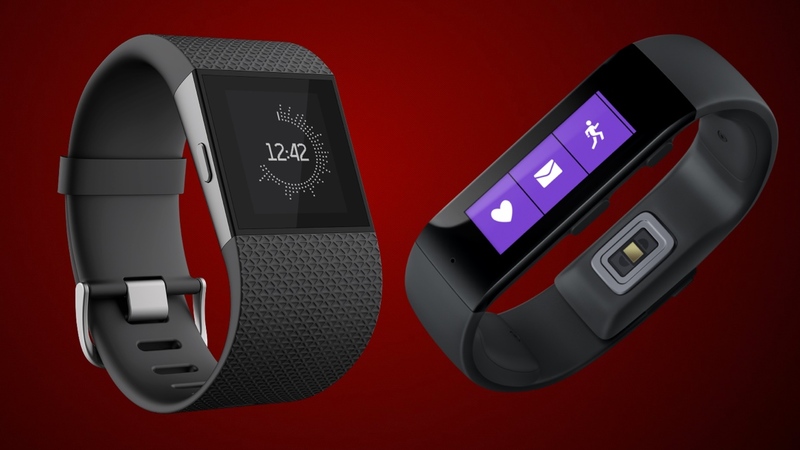 Both the Fitbit Surge and the Microsoft Band pack in 24/7 heart rate monitoring. Continuous heart rate monitoring technology is still in its infancy, but it enables users to track a wider range of sports, as well as gym work much more accurately. It's also crucial for working out accurate calorie burn and determining essential rest periods. The addition of GPS connectivity on both devices means that stats like pace, distance, elevation, split times, route history and workout summaries will be available to wearers, with a lot more accuracy than you'd traditionally get with a fitness tracker. The Fitbit Surge can expect a five to seven day battery life from its Lithium-polymer battery, Microsoft's Band offers just two days - and that's with various functions turned off. The Surge is IP68 certified and carries a water resistant rating of 5ATM, which means you’ll have no problems wearing it in the pool. The Band is splash and sweat proof, but not water resistant, so no swimming data can be recorded and you shouldn’t even wear it in the shower. The Microsoft Band is platform agnostic - a clever move from the software specialist as it means that Android and iOS users can access the new Microsoft Health platform, there's no need to go out and buy a Windows Phone to get involved. The Band boasts step and calorie burn recording, as well as sleep quality analysis. You can view your daily or weekly stats, set goals, and receive a virtual high-five when you hit them through the app, and there are also guided workouts on offer with programs from the likes of Gold's Gym, Shape and Men's Fitness all available directly from the device. The Fitbit app is available across Windows Phone, iOS and Android, and the data from your Surge will also sync with the info from your Fitbit Aria Wi-Fi Scales. The app shows you your progress, lets you record workouts, map routes, share and compete with your friends, log your food intake and earn badges based on your activity achievements. The Surge supports running, cross-training, biking, strength and cardio workouts and also offers the regular fitness tracking functions – so it will record your number of steps, floors climbed, distance travelled, calories burned and it also measure your sleep quality. With the Microsoft Band you can see incoming call alerts, text notifications, email and calendar updates and social media alerts from Facebook and Twitter. There’s no third-party support but you can turn on a ‘Notifications Center’ tile to have every single message relayed on your Band. The Fitbit Surge will display smartwatch notifications such as incoming calls and texts, and it also has the ability to control your music but there's no third party app notification support at present. An easy win for Microsoft on this front. The Fitbit Surge will set you back £200 in the UK, $249 in the US. Microsoft's Band is only available in the States at the moment and costs $200. While we've only had limited hands on time with the Fitbit Surge and its costlier price-tag may put some people off, we're pretty confident that the Surge is the better option. Sure, its notification skills aren't on a par with the Microsoft device and the display is nowhere near as impressive but as an all-round fitness wearable, the Surge wins hands-down - with the primary reason being that it is, well, wearable. The Microsoft Band is just too clunky and far too uncomfortable and, despite packing in some great hardware, fails on a fundamental level because of its levels of extreme discomfort. However, be sure to also check out our super watch showdown, to see how the Fitbit Surge and the Apple Watch measure up.